While I’m working on a longer post concerning the convoluted chronology of TURN’s pilot episode, I thought I’d write a short post concerning a (literally) tiny realm of 18th century material culture seen in the show thus far: babies! Abraham Woodhull and his young son in the pilot episode of TURN. Click to view larger image. Little Thomas Woodhull, whom Abraham fondly calls “Sprout,” steals the spotlight at the beginning and end of the TURN pilot episode. (His very appearance is a bit of a chronological anomaly, but we’ll discuss that later.) Abraham mentions that his son is “almost a year old” as he eggs him on to start walking on his own. Adorable outfit he’s wearing, right? Breeches and a linen shirt, like the little colonial man he is! Except what he should be wearing at that tender age is… a gown. Yes, a gown, as in “a dress.” Sometimes boys even wore stays, too. 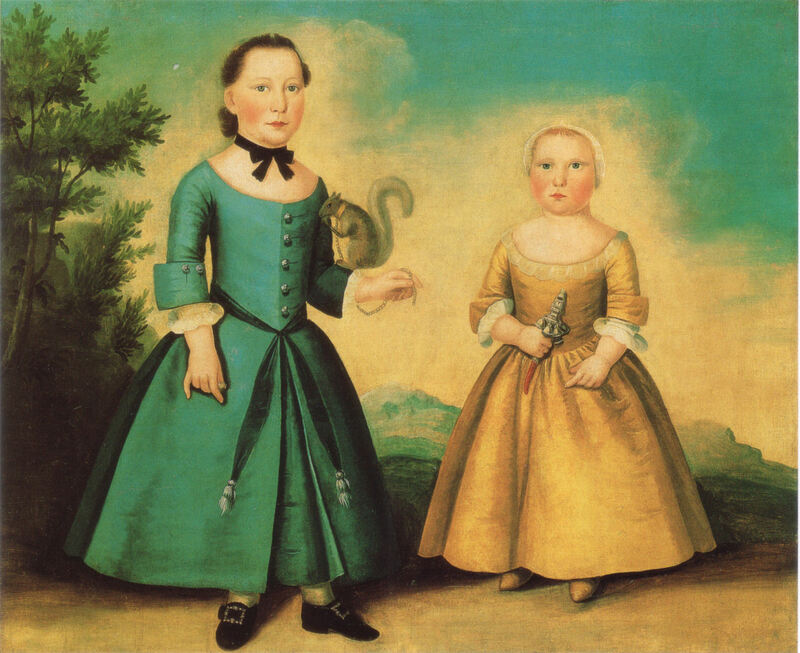 “Portrait of Two Children” attributed to Joseph Badger (Abby Aldrich Rockefeller Folk Art Museum, 57.100.15). Young boys and girls in paintings like these were often distinguished by the objects and toys they were holding. The child on the left, for example, is a boy with his pet squirrel. So yes, if you were to time-travel back to the era of the American Revolution, you might very well see a young six-year-old boy wearing stays and a gown. In fact, in 1790, Benjamin Tallmadge’s own son was wearing them at the tender age of three. For more information, I highly recommend reading Linda Baumgarten’s primer on colonial children’s clothing (the source of the above quote). And if you weren’t sure what I was talking about when I mentioned ‘stays’ earlier, don’t forget to check out Baumgartner’s very helpful glossary of clothing terms, too. Additionally, you can browse through a slideshow of primary source images concerning children and babies over at the 18th Century Material Culture Resource Center. In this case, I could understand the rationale behind “breeching” little Thomas several years early in TURN. A little boy wearing a feminine gown would be confusing and strange to the average 21st-century viewer, and distracting enough to detract from the main storyline. (Don’t believe me? Look at the above painting and take a guess as to how much airtime would be needed to explain that boy’s outfit to a modern-day viewer.) Still, the fact is that little hipster Sprout’s outfit IS several years ahead of his time, according to the historical record. I know — not exactly a hugely significant issue in the greater storyline of TURN (and definitely not as big of a sartorial gaffe as, say, the bizarre garb that the Queen’s Rangers are wearing), but I thought readers might enjoy a small and pleasant domestic diversion while I finish making sense of the premiere episode’s Swiss-cheese timeline. And don’t worry — we’ll be discussing plenty of military details here on the blog soon enough. Also, if you haven’t seen the preview for next Sunday’s episode yet, you can view it here. And don’t forget to join the fun over at TURN to a Historian’s Facebook Page and tumblr account. More on the way soon! This entry was posted in clothing, material culture and tagged 18th century clothing, 18th century gowns, Abraham Woodhull, amc turn, historical costuming, Linda Baumgarten, material culture, sprout, Thomas Woodhull, TURN, turn amc, TURN premiere.